Impress your friends and make your neighbors jealous by having West Shore Home install gorgeous French doors at your home. Perfect for the front entryway, back patio entrance, or any doorway in between, French doors can provide a portal between two rooms or work as a bridge, connecting the outdoors with the interior of your home. These elegant, hinged doors open up completely, making a large entryway that is ideal for letting in natural light, enjoying the nice weather, bringing in large objects, providing an entry/exit point during parties or gatherings, or just enjoying a beautiful view of your property. Don’t settle for boring, ordinary doors that don’t bring anything to the table when you can have elegant French doors that will transform your home, installed in just one day. Want a French door in the front of your home, but are worried about security? Have no fear, our front entry French doors not only look great, but provide unparalleled protection, too. We also have many customizable door options like internal grid patterns, a variety of colors and finishes, decorative glass, sidelites, transoms, and internal blinds. Of course, all of our French doors are energy efficient, minimizing heat transfer and potentially saving you money on your heating and cooling costs. 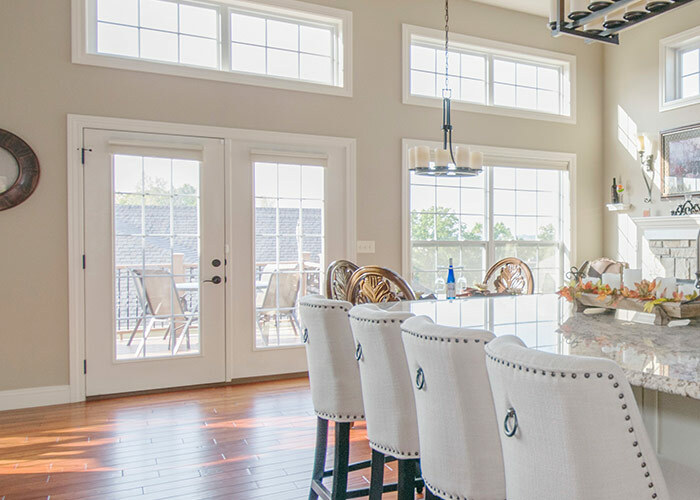 All of our French doors are rigorously tested and certified by independent laboratories to meet the ENERGY STAR® standards established by the Environmental Protection Agency (EPA) and the U.S. Department of Energy. Our French doors allow you to express your personal style thanks to the wide range of customization choices you have to choose from. They are also available in custom widths and heights in 1/8” increments as well as standard sizes. Our French doors will withstand the rigors of daily use while protecting your home from outdoor weather and forced entry. Frames and sashes resist cracking, peeling, chipping, and blistering with very little maintenance on your part.